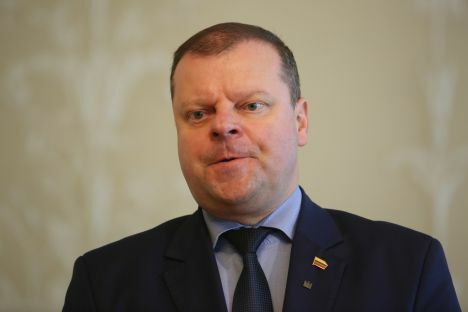 Prime Minister Saulius Skvernelis said this week he will use the opportunity to take unpaid leave for the presidential election campaign. He also stressed that he would take unpaid leave only if the situation in the government would allow that. Skvernelis also said he would not use administrative resources for the presidential election campaign, as much as possible. Lithuania will elect a new president in early May. President Dalia Grybauskaitė warned about weakening international attention to Ukraine as she met with President Petro Poroshenko on the sidelines of the World Economic Forum in Davos on Thursday. January 24. Lithuania has been one of the staunchest supporters of Ukraine following Russia’s annexation of Crimea in 2014. Moscow-backed separatists took control of part of Eastern Ukraine in the same year. In Davos, Grybauskaite also met with Armenian Prime Minister Nikol Pashinyan. A Vilnius court ruled on Thursday, January 24, that MP Vytautas Bakas did damage to MG Baltic’s reputation when he likened the company to an organised criminal group and said it had caused damage to the state. Although Bakas’ statements are considered to be an opinion, the politician had to substantiate his claims, the Vilnius court said in its ruling, which can be appealed to a higher court. However, the court did not award MG Baltic 20,000 euros as compensation for non-pecuniary damage, saying the mere recognition of Bakas’ statements as not corresponding to reality was adequate satisfaction. MG Baltic took Bakas to court over his statements that the business group’s activities bore signs of an organized criminal group and that it had caused around 500 million euros in damage to the state. Bakas, who chairs of the Seimas Committee on National Security and Defence, headed a parliamentary investigation that found that MG Baltic’s activities posed a threat to Lithuanian national security. Jonas Mekas, a Lithuanian-born American artist, poet and filmmaker, who died at the age of 96 in his home in New York City on Wednesday, January 23, will be cremated over the upcoming days, says ex-Vilnius Mayor Artūras Zuokas, a friend of Mekas’ family. In his words, Mekas’ son Sebastian said the family also plans to consider his father’s last will regarding his funeral. He also reminded of the non-traditional funeral of Mekas’ friend and the initiator of the Fluxus movement, Jurgis Mačiūnas whose ashes were scattered over the Hudson River flowing into the Atlantic, and part of the river’s waters was later released into the Vilnelė River in Vilnius. According to Zuokas, Mekas’ family is considering honouring the memory of Mekas in a similar way. Mekas is one of the most famous Lithuanian artists of the 20th century. He is best known for his experimental films and often called the godfather of American avant-garde cinema. Following several years of litigation, a Vilnius court has finally ruled that foreign-language decorative street signs in Vilnius do not breach the law. In a binding ruling on Wednesday, January 23, the Supreme Administrative Court of Lithuania rejected the complaint by Vilda Vaičiūnienė, the Lithuanian government’s representative in the Vilnius county, who had asked the court to change the ruling of a court of lower instance or refer the case back to the court of first instance. She turned to court over Vilnius Mayor Remigijus Šimašius initiative, launched in 2015, to install non-Lithuanian street signs in Vilnius, asking courts to order their removal as they allegedly violated the law and might be inciting discord. The Lithuanian Radio and Television Commission (LRTK) decided this week to ask Youtube to remove the video clip of a Rossiya 24 TV news report smearing Lithuanian partisans as “killers of peaceful people”. LRKT Chairman Mantas Martisius told BNS that the radio and TV watchdog took the decision on Wednesday, January 23, after discussing a complaint from conservative MPs Laurynas Kasčiūnas and Audronius Ažubalis. Martisius said the commission did not launch a probe into the news report, which was not rebroadcast in Lithuania but was posted on Youtube. LRTK also decided to launch a probe over the Russian-language PBK Lietuva channel, based on a complaint that its news program Vremya (Time) broadcast content that was insulting to participants of the bloody events in Vilnius on January 13, 1991. Lithuania and Vietnam signed on Wednesday, January 23, a readmission agreement that will facilitate the deportation of illegal migrants, the Lithuanian Interior Ministry said. Lithuania has faced the problem of illegal Vietnamese migrants since independence, but their flow has been unsteady in recent years. Figures from the border guard service show that 374 Vietnamese nationals were deported from Lithuania in 2015, 210 in 2016, 85 in 2017, and 122 in 2018.The readmission agreement is expected to make this process much easier and faster. The Panėvežys Regional Court on Tuesday, January 22, started hearing a political corruption case involving the Order and Justice Party. The court rejected defence lawyers’ motions to remove Evaldas Vanagas, one of the trial judges, from the proceedings and to return the indictment to the prosecutors. Charges were brought against the Order and Justice Party as a legal entity and six private individuals, including former MP Rimas Antanas Rucys and businessmen Rolandas Skaisgirys, Peisachas Kačerginskis, Giedrius Rakauskas, Vytautas Banys and Justinas Garliauskas. The party is accused of obtaining over 350,000 euros in funds as bribes or through other illegal means and the businessmen are suspected of being accomplices in the schemes. Law-enforcement officials believe the Order and Justice spent the money on publicity. The Bank of Lithuania has no new information about Revolut and sees no grounds for an additional assessment of the UK-based start-up that last month was granted a specialized bank license, a member of the central bank’s board said on Tuesday following media reports that the father of the firm’s CEO holds a high-ranking position at Russia’s state-controlled gas group Gazprom. At the same time, Marius Jurgilas warned against sowing public distrust in the country’s financial system. The public broadcaster Lithuanian Radio and Television (LRT) reported on Tuesday, January 22, that the father of Revolut CEO Nikolay Storonsky holds the position of deputy director general for science at Gazprom Promgaz, the group’s research centre. Jurgilas said much of the information in the LRT report had already been publicly available. Lithuania in December became the first EU country to issue Revolut with a specialised bank license.